Wakey Wakey Big Brown Bear! 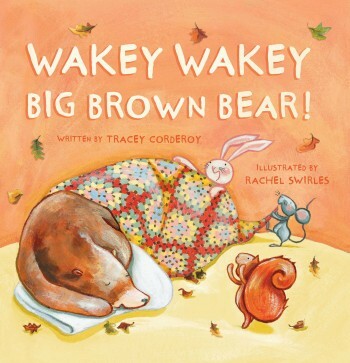 Wakey Wakey Big Brown Bear by Tracey Corderoy is an ideal book for little ones in Autumn. The story is all about a Big Brown Bear who, like all brown bears, must hibernate at the start of Autumn and not wake up until Spring. This brown bear is a little bit worried that he might miss out on all the fun that the Autumn and Winter seasons have to offer, so he is not so keen to go off and hibernate. To cheer him up all his friends promise to wake him up when anything exciting happens so he won’t miss out! I found Wakey Wakey Big Brown Bear a really sweet book and the boys and I enjoyed reading it together, especially as they could relate many the things that the animals mentioned back to what they have been doing recently in Autumn too – like crunching leaves and splashing in puddles. Autumn was coming. 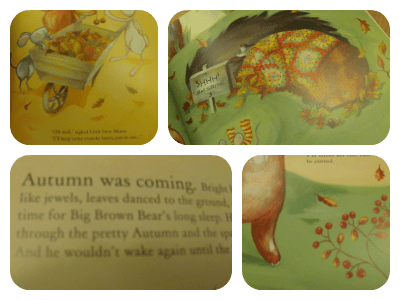 Bright berries shone like jewels, leaves danced to the ground, and it was time for Big Brown Bear’s long sleep. 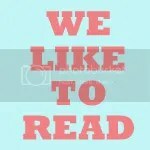 The moral and sentiment of the book is great too, all about going the extra distance for your friends. The animals weren’t able to wake up Big Brown Bear, so rather than shrug to themselves and say “oh well” they decided to save all the best bits of Autumn and winter for him to enjoy when he finally woke up in the Spring! It’s a tale of friendship, and of appreciating and enjoying nature and the world around you – both things I would like my children to learn as they grow up! The illustrations by Rachel Swirles are also very appealing, with all the gorgeous Autumn colours. I have to say, as soon as I saw this year’s John Lewis Christmas advert it reminded me of Wakey Wakey Big Brown Bear – so anyone who has enjoyed that advert, should give this book a try with their children! We were sent a copy of Wakey Wakey Big Brown Bear to review through the Parragon Book Buddies scheme. It sounds a lovely book, I’ve always found animal books best!